The day is upon us, and we’ve had this new holster from CrossBreed for a few weeks now. 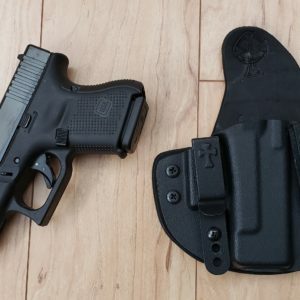 CrossBreed Holsters is excited to announce the latest expansion to our lineup of the finest concealed carry holsters on the market with our latest addition, “The Reckoning” Holster. The Reckoning Holster is the perfect combination of Old-World Craftsmanship meets New-World features. 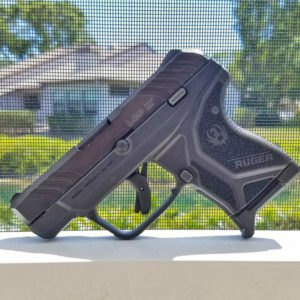 The Reckoning Holster features multiple points of retention adjustment including the ability to tighten the screws mounting the Kydex Pocket to the leather backer, and a retention device installed directly under the trigger guard. The Reckoning Holster can be worn inside the waistband on the strong side, appendix, or cross draw positions. 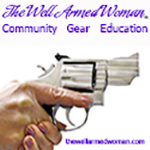 This can also be easily converted to an outside the waistband holster with simple hardware. The Reckoning Holster incorporates a top grain leather backer, in all the familiar CrossBreed leather options. These include black cowhide, premium horsehide, or Founder’s Series 100% vegetable tanned leather. 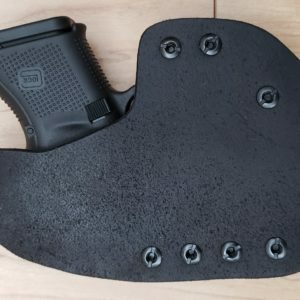 This cutting-edge holster not only provides the comfort you come to expect from CrossBreed, but also fine-tuned adjustment potential, and customization in the future like adding an attachable mag carrier. 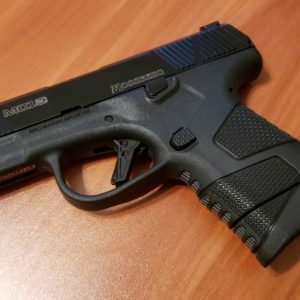 CrossBreed Holsters currently makes the new “Reckoning Holster” for the most popular, best-selling firearms in the industry, such as the Sig Sauer P365 and Smith & Wesson M&P Shield and is continually adding firearm options. 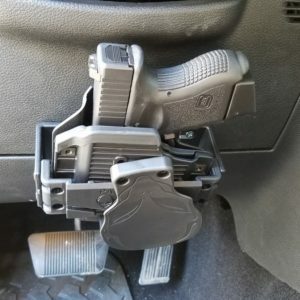 After using this holster for a few weeks now, I can give a pretty solid opinion. Let’s first start off with the design. If small is your game, this holster is for you. 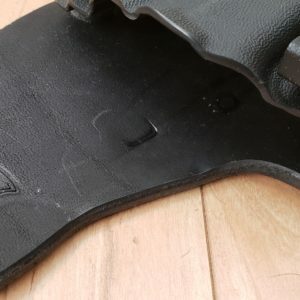 Unlike your typical IWB holster with all the extra leather on the right and left, the clips here instead are attached to the kydex shell. This allows for a much smaller design, and does not sacrifice on comfort. You’re able to choose from different clips so if you’re not a fan of the metal ones that you see in the photo above, they do have other options available. 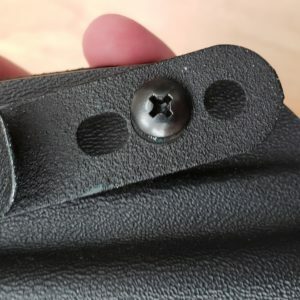 The backing for the holster looks much like you’d expect from CrossBreed, and the nuts that hold the screws in place are no bother on the skin. 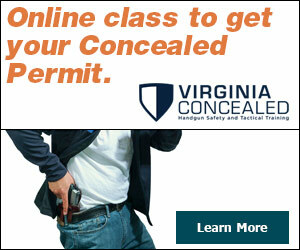 Likely you’ll have some article of clothing in between yourself and the holster, so it should be a non-issue anyway. 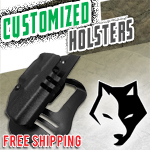 The cut on this holster allows for an easy draw, as you can get a full grip on the firearm when drawing. 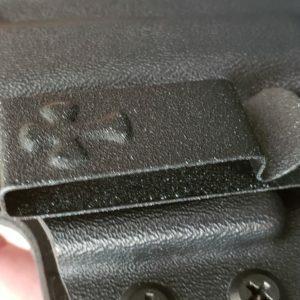 I believe it’s called the Combat Cut, and it’s likely to be standard on this holster. I could be wrong, but my advice is to always get the combat cut. Always. Now let’s talk retention. The first group of retention-setting devices is something that you’re probably familiar with. 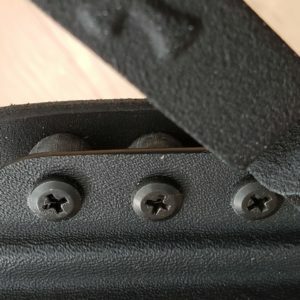 It’s a screw that goes trough a grommet, and allows you to tighten down or loosen up the holster’s ‘grip’ on the firearm. 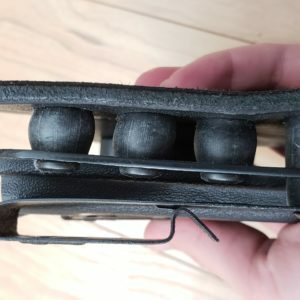 I always find that my holsters come perfectly from CrossBreed, but here’s your ability to fine-tune anything that you may not like. The other side is where we have some trigger guard retention. 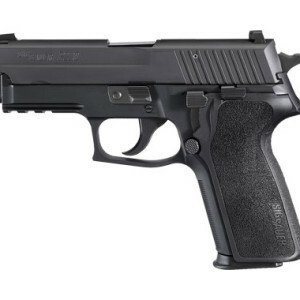 They’ve added a device that tightens or loosens around the trigger guard by turning an allen screw either clockwise or counter-clockwise. I haven’t touched it because my retention was nice out of the box, but again, the option is there if you want to do some adjustment. To make things even better, they have the usual cant adjustment on the clips themselves. 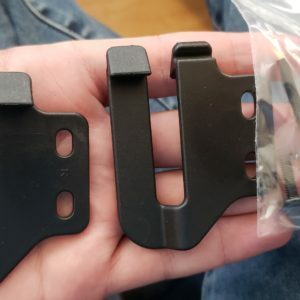 Each has 3 holes, and allows you to make your holster ride higher or lower, as well as adjusting the angle. It’s a simple implementation that’s extremely useful. The options for the backing are: black cowhide, premium horsehide, or Founder’s Series 100% vegetable tanned leather. This particular holster uses the black cowhide, which I feel is very nice, but prefer the premium horsehide. It’s softer, I like the color over the black, and it’s said to be better at handling moisture. 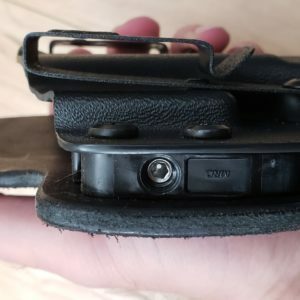 For the OWB option, you are able to receive two clips that attach to the holster and boom, now you’re carrying Outside The Waistband! 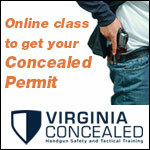 Again, it’s a simple and easy solution to convert your holster for different circumstances. 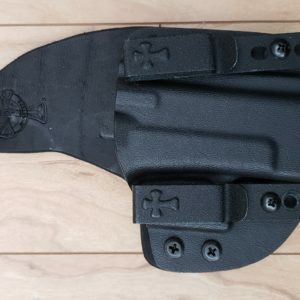 Overall, I am very pleased with what CrossBreed has to offer with this holster. While their other holsters are comfortable, I find this one to be even more comfortable due to the smaller size in the leather. 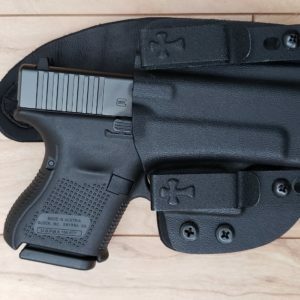 This holster gets an ‘A’ rating from this reviewer, and I’m anxious to see what those who purchase it think about it as well.